The Neumann KH310A active nearfield monitor has long been a favourite among the editorial staff and my co-contributors at Sound On Sound magazine. It’s well respected in the wider pro-audio world too. However, although I’ve experienced the KH310A away from home on a couple of occasions, I’ve never had the opportunity to use a pair in my own studio room. This was put right recently when Neumann kindly lent me a pair for a few days. 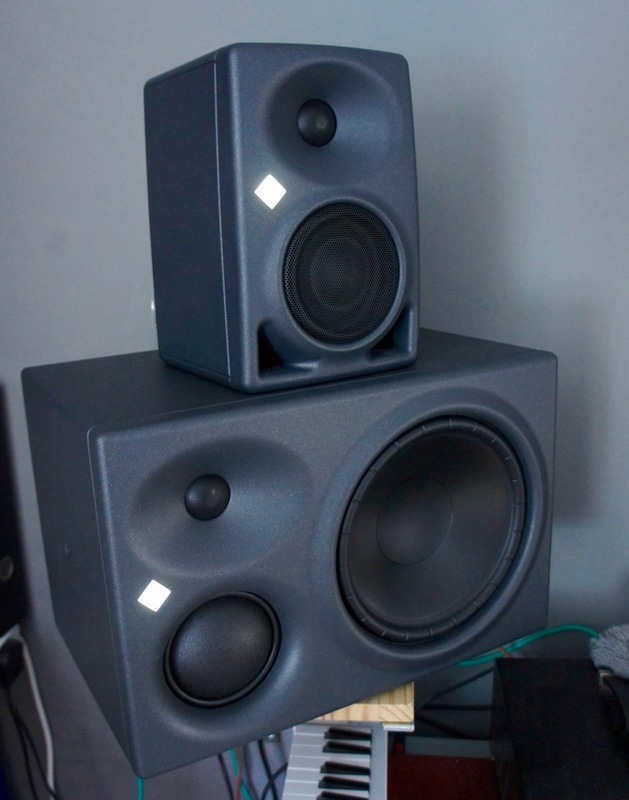 Along with the KH310A I was also lent a pair of the new, KH80 DSP compact monitors to try. The KH310A is unusual for a few reasons. Firstly, in a world dominated by monitors with reflex ports, the KH310A is a closed box system so won’t demonstrate the higher levels of low frequency latency that are inherent to ported designs (see my previous Ports and Boxes post). It also won’t display the miscellaneous distortion and compression effects that can result from airflow in a port. Secondly, despite its relatively compact dimensions the KH310A is a three-way design, with an unusual 75mm diameter fabric dome midrange driver. When well engineered, three-way speakers have the great advantage of bass and mid drivers that can be designed specifically for relatively narrow operational bands. The bass driver only has to play bass and the midrange driver only has to play midrange. Conversely, the bass/mid drivers of two-way systems are always compromised by the need to cover perhaps six octaves. It’s actually difficult to overstate the potential benefits that a three-way architecture can bring (unfortunately it’s also difficult to overstate the added manufacturing costs of doing it well). It was really no great surprise, once I’d installed the KH310As either side of my workstation and fired them up, that they definitely deliver the goods. They are hugely capable nearfield monitors with a character built on an extended and precise low frequency foundation. Somehow, once any doubt about the bass is taken away, the rest of the job of a monitor seems to becomes so much more straightforward. Similarly, to my ears, there’s often something very “grown-up” in the character of a well sorted three-way speaker, and the KH310A offers a generous slice of it. It’s an engaging, wide bandwidth dynamic and detailed character that’s truly revealing of the source material. The KH310A is of course not the least expensive three-way nearfield monitoring option out there, but considering the performance and quality it offers I don’t think there are actually all that many genuine competitors. I would very happily have kept hold of the KH310A for far longer than I was able to. Considering its size, the KH80 DSP is also not the least expensive monitor out there, however it is both very significantly more affordable than the KH310A, and offers a seriously impressive level of performance for its tiny dimensions. As suggested by the product name, the KH80 DSP achieves its performance through the use of a some heavyweight digital signal processing that’s employed to implement its crossover filters, flatten its amplitude response, equalise its phase response and manage its low frequency power handling. Like the KH310A, the KH80 DSP is a truly classy performer that punches well above its weight and is actually I think competitive with some much larger monitors. While it doesn’t have the bass extension, accuracy and dynamics of the KH310A, its character across the rest of the band is uncannily similar – no mean feat when, due to their dissimilar dimensions, the dispersion characteristics of the two monitors will be significantly different. Just as much as I enjoyed and appreciated the performance of the two Neumann monitors, I also also admired their complete package: from the solid, engineered feel of their construction to the comprehensive clarity of their technical specs and user manuals. Everything about them speaks of professional competence and quality.